Link - Episode 17 (right click and save as to avoid it playing in your browser), or go to iTunes (see below). just me and DdC jabbering away tonight, but still for 90+ minutes and that's after we both said "lets keep it short". As we say in the show, if you have ideas of what we can talk about tell us. if you want to take part tell us. Thanks. I'm looking forward to it as I'm imagining a kind of "Derek & Clive Get the Horn" kind of vibe, or perhaps "Smith & Jones" if you prefer. PS Good work for getting it posted up so soon after the event. Not much editing required I guess! I'll try and make the next one. As they are a good laugh. They were called Corgi cars as at the time of manufacture they were the only popular dog's arse they wouldn't fit up. Shoot, I forgot to register my unavailability for last nights podcast. Cant wait to listen though. Mulletino wrote: They were called Corgi cars as at the time of manufacture they were the only popular dog's arse they wouldn't fit up. Does Clever Original Concepts stand for Corgi? Why couldn't I help think of these two though?? Jonah wrote: Well done you two. 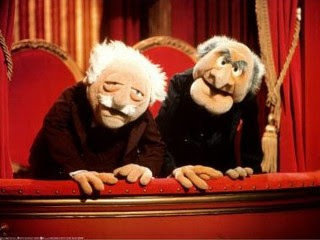 You're not suggesting that Duddly & DaddyR are a couple of Muppets are you? Good work lads as always. @ DudleyDaCat pretty sure PSN store has a Mini Ninjas Demo on it as i played the demo before i bought it cheap also and it is great fun. Got mine from Asda for £20 a couple of months back. @ DaddyR Im with you on the quicktime stuff putting me of Heavy Rain as its not something i like doing in games as im to slow. Yet i will wait for OAP reviews to help me decide. Also finish Uncharted 1 before the second one as both games are great to look at and play. Plus im a Final Fantasy sucker so thats my big wish list. Another lovely outing for the OAP podcast. Just a quick word about the SOCOM quads, it would seem some are not so sure about the team names. Well I had asked the Captains if they wanted assigned names or if they wanted to choose their own names. Well they all decided on assigned names. Perhaps on the next Podcast, depending on who makes it onto the recording someone can give a review of hows things are going with regards to the the Quads. Alright, first of all "so that is the meaning of life"? WTF? Secondly, about Uncharted DLC, the reason you are paying for skins is because you got a map recently for free. You never notice the things you get for free do you? Its like the outfits in Street Fighter 4, you had to pay for those but it gave you the championship mode for free. So you get something which would normally split the community for free while you have to pay for something completely optional which does not effect gameplay? It's a good deal isn't it? Yaster wrote: Secondly, about Uncharted DLC, the reason you are paying for skins is because you got a map recently for free. You never notice the things you get for free do you? By jove, you're right! I didn't even realise there was a free map, where is it? I just don't buy the stuff I don't want to pay for, or i'll wait till the price is reduced to one i'm willing to pay. Lovely podcast, really had a laugh.